While other African countries lapsed into civil wars and bloodshed,not in Dr Kaunda’s Zambia.It took the magnanimity and insight of Dr Kaunda to unite the seventy two plus tribal and ethnic groups into the strong single entity that Zambia is today. "Yes, we had instinctively and tacitly made a resolution to cherish unity.That, regardless of tribal,ethnic, racial backgrounds or any differences, in Dr Kaunda’s nation and successive leaderships in Zambia we would always clasp our hands into one another ’s -as one wonderful,vibrant,progressive and victorious people. 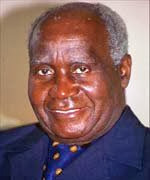 We are exceedingly proud that in Dr Kaunda we have a patriarch and architect of the Zambian nation. We are grateful that our own Dr Kaunda has truly lived to be an embodiment of love,wisdom,selflessness,unity, fortitude and a progressive vision."